I’ve been in the recruiting industry for almost 35 years and counting. Before that, I had a pretty good run at two major Fortune 500 companies. Over the years I learned some big lessons and some great tactics about hiring top talent. All of the best ones are included here, or by reference to my earlier book, Hire With Your Head (©2007, Third Edition, John Wiley and Sons, Inc.). Hire With Your Head was written for hiring managers and recruiters with the focus on finding great candidates, interviewing and assessing them, and negotiating offers on fair and equitable terms. 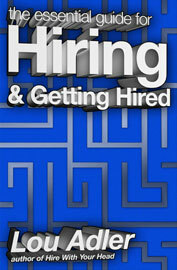 This book has been written for anyone involved in any aspect of the hiring process. This includes candidates, people who aren’t looking but will be or should be, anyone who needs to interview anyone else, and of course hiring managers, recruiters, and company executives who care about hiring great people. Since the first edition of Hire With Your Head was written in 1997, much has changed, but not as much as you might think. The job boards have come and gone and come again. Social networks have emerged as the new standard for finding people and finding jobs. The workforce has been globalized. Corporate recruiters have become an industry force and external search firms now play a different, but still critical role. New analytical tools have emerged, including supply vs. demand analysis and real-time recruiter dashboards tracking every measure of ongoing performance. 1)	Companies continue to seek out the next sourcing silver bullet, expecting a bunch of top people to be actively looking in some secret place no one else has been able to find. 2)	Companies continue to rely on a “surplus of candidates” mentality when designing their hiring processes. The problem is that you can’t use a surplus approach in a talent scarcity situation. 3)	While hiring top talent is good corporate-speak, it doesn’t translate down to the operating level where hiring decisions are made. If it did, hiring managers’ primary performance measure would be the quality of the people on their team and whom they’ve hired. 4)	Everyone makes excuses and no one takes responsibility for Quality of Hire. The legal and compensation groups are blamed for just about everything, but too much work, disengaged managers, and silly bureaucratic rules represent the balance. 5)	Candidates don’t know how to play the hiring game. Some are too eager, some not eager enough. Some talk too much, some not enough. Most don’t know how to present themselves properly. Too many think maximizing compensation is more important than maximizing the career opportunity. All in all, it’s not surprising that people take jobs for all of the wrong reasons, and wonder why they’re not doing as well as they should be. 1)	If you’re a candidate, take advantage of the existing ill-designed systems and learn to navigate around the roadblocks and through the detours. 2)	If you’re a recruiter, work together with one of your hiring managers and learn how to find and hire one great person. You’ll get the hang of it pretty quickly, and then you can start convincing all of your other hiring managers how hiring needs to be done. 3)	If you’re a hiring manager, find a recruiter you trust and work on your toughest new hiring project together. Then hone the process and coach your other managers through the techniques. 4)	If you’re a recruiting or HR leader, conduct a benchmark pilot program comparing the approaches mentioned in the book to your current processes. You’ll quickly discover that when Quality of Hire is the primary or driving metric, quality improves, costs decline, and time-to-fill shortens. 5)	If you’re a company executive, understand why your talent acquisition strategy is sound in theory, but flawed in execution. To get a sense of this, all you have to do is look at some of your company’s public job postings. As you read them, ask yourself if a top fully employed person who is not looking would spend the time and energy to even consider them. Everyone intuitively knows that hiring top talent should be one of the primary focuses of hiring managers. Surprisingly few managers are measured on how well they do, and most do it any way they want. Most make excuses of the “have to get the work done” variety as to why it’s more talk and hope than reality. Understanding why people perform at peak levels or underperform is not unknown science. What’s surprising is that companies don’t take this into account when hiring someone. Instead, they decide to fix the problem after the fact. In 1999 Marcus Buckingham and Curt Coffman of the Gallup Group wrote First Break All the Rules: What the World’s Greatest Managers Do Differently. This is where they first introduced their Q12 list of criteria that employees require in order to maximize their performance and on-the-job satisfaction. At the top of the list were: clarifying expectations up front, providing people with the right tools and resources to do the job properly, having managers that support them, and being assigned work they enjoy and are good at. As part of the study, Buckingham and Coffman described four keys to becoming an excellent manager. These involved defining the results, finding people who could deliver these results, leveraging their employees’ strengths, and selecting staff for talent, not raw knowledge or skills. 1)	Breaking down the steps in the hiring process into independent silos rather than considering the process as a fully integrated business system. This is akin to the concept of doing things serially rather than doing them in parallel. There is too much friction and loss between the silos. 2)	Companies relying on a talent surplus strategy to find people in a talent scarcity situation. A surplus model is based on attracting the many and weeding out the weak to fill a specific role. A scarcity model is based on only attracting the best and tweaking the position to better fit their needs. 3)	An overreliance on indirect methods to find, assess, and hire top talent when direct methods are possible. To quickly get your arms around this point, consider that job descriptions actually define people, competency models are based on probabilities, behavioral interviewing ignores the actual job and the manager, top candidates are not looking for lateral transfers, and first impressions don’t predict performance. 4)	Lack of ownership on the part of the hiring manager. Earlier this year I met the president of a fast-growing Russian-based technology company. In perfect English he asked me a very unusual question. It went something like this: “I read your book, Hire With Your Head, and if hiring top talent is so important, shouldn’t every hiring manager be judged on how well they do it?” The answer, of course, is yes, and if hiring managers are not measured on this score at your company, hiring top talent is not number one. Finding top people with tools like LinkedIn, Google+, and CareerBuilder’s Talent Network is actually not all that difficult. Unfortunately, changing strategies, thinking systematically, focusing on the real job, and requiring managers to take full responsibility for everyone they hire, needs to be the starting point. The objective of this book is to provide a simple framework to jumpstart this effort. It starts by rethinking strategies, processes, and responsibilities. 1)	Hiring managers who consistently hired good people understood the real job requirements. As a result they did not rely on traditional job descriptions to screen or select candidates. They focused instead on what the person actually accomplished in comparison to what needed to be done. This is still true today. 2)	The best candidates, whether employed or not, always considered the long-term career opportunity more important than the short-term package. None ever got excited by reading a traditional job description. This is still true today. 3)	Very few managers were good interviewers, yet they all thought they were. This is still true today. At the time I wasn’t very good either, but I needed to be, so I started benchmarking what the managers who hired good people did. They all seemed to ask variations of two basic questions, which I started using. As a result I then became a very good interviewer. These two questions now form the core of the performance-based interviewing process described in this book. Using these same two questions, all managers can quickly become great at assessing everything they need to know to make an accurate hiring decision. 4)	There was very little logic or science involved in going from what was learned in the interview to making a yes-or-no hiring decision. Most companies used some type of informal debriefing process that involved some casual discussion. In reality this was nothing more than adding up a bunch of yes/no votes with “no” votes given more weight than “yes” votes, and those with more authority having more influence on the final result. 5)	More hiring mistakes were made in the first 30 minutes of an interview than any other time, largely due to the impact of the candidate’s first impression on the interviewer. Based on their initial reaction to a candidate, interviewers then followed a specific script, going out of their way to prove the candidate was incompetent if they didn’t like the person, and seeking only positive information if they did. 6)	Each step in the hiring process was largely independent from the other steps, adding inefficiency, time, and cost to the process. Advertising was hard to find and uninteresting. Compensation was the primary filter, not ability. Weeding out the weak was more important than attracting the best. Recruiters and hiring managers didn’t know what the other was looking for or looking at. As a result, the person ultimately hired was the best person who applied, not the best person available. This is still true today. •	The fact that it’s a system is one reason why it works. •	The fact that it’s designed based on the needs of a top-performing person who’s not looking is another reason that it works. •	The fact that the emphasis is on maximizing career growth, not compensation, is another reason why it works. •	But most important of all, the reason it works is that the foundation of the process is based on real job needs, not a job description. (Note: As far as I’m concerned, the over-reliance on job descriptions instead of commonsense is the primary reason companies can’t hire enough good people, including military vets and diverse candidates.) However, to make it work seamlessly, the recruiter and hiring manager need to form a partnership based on trust, with both knowing they have an equal stake in the process and the outcome. Individually, recruiters or hiring managers can’t improve Quality of Hire very much no matter how capable they are. Together, they can do far better than working alone, but this is only one search at a time. Realistically, it seems foolhardy to delegate a company’s talent acquisition strategy to each hiring manager and recruiter team who use their own individual techniques, and then hope for an optimum in-the-best-interests-of-the-company decision. Functional VPs and department heads certainly impose hiring guidelines that will improve the quality of each hiring decision made within their group. This is a good start, and much of what’s presented in this book will help them get there or improve what they’re already doing. In fact, much of what’s presented in this book will allow any recruiter or any hiring manager do a better job filling one requisition at a time. However, to make the process work companywide, a different talent acquisition strategy is required that underlies and drives each step in the process. Implementing an integrated system like Performance-based Hiring is a key part of this, since each step complements each other step, rather than compromising them. In this book I suggest the implementation of a talent scarcity hiring model as the core strategy. This is based on the assumption that the demand for top talent is far greater than the supply. In this situation, a company must offer career opportunities rather than lateral transfers; be open to flex the job somewhat to attract and hire more high achievers who might be light on experience and skills but high on potential; use an evidence-based interviewing and assessment process rather than generic behavioral interviewing; and make each hiring manager fully responsible for the people they hire. Collectively, this is how you implement a Raising the Talent Bar strategy. In this approach, not only must candidates balance long-term opportunities with short-term rewards, but companies and hiring managers must do likewise. If hiring top talent is number one, hiring managers must be measured on how well they do it, and be trained to do it right. Without some intervention, most managers will emphasize their short-term business requirements and naturally overvalue experience for potential. They’ll also be less prepared, give short shrift to the entire hiring process, and make emotional instead of logical decisions. This is one sure way to maintain the status-quo talent level. No amount of training will help with this as a starting mindset. But when combined with appropriate tracking metrics, a Scarcity of Talent strategy plus a business process like Performance-based Hiring, minimal training will result in far better hires and fewer mistakes companywide. This is an odd book. Not only does it describe what you need to do to find and hire a person, it also describes what you need to do if you’re the person being found and hired. Here’s some big advisory points as you consider hiring from the candidate’s side of the desk: 1) be prepared whether you’re looking or not, and 2) don’t be too hungry if you’re looking, and don’t be too hard to approach if you’re not. Perceptions have a lot to do with who gets hired, so striking the right balance of open-mindedness, long-term career focus, and selectivity is important. Throughout this book suggestions are provided to the candidate on how to handle a specific technique, whether it’s answering a question or negotiating an offer. In some way these are countermeasures to use when the interviewer isn’t using the techniques described in the book. In this case, the idea is to ask appropriate questions to get the interviewer or recruiter to use the proper techniques. This will help improve your odds of getting a job you deserve. Note: you will be judged fairly and accurately when the interviewer(s) are using the techniques described in this book, as long as you’re prepared, open-minded, and appropriately interested. Let me be perfectly clear on the purpose of this book regarding all of the candidate-facing advice: it is not intended to help you get a job you don’t deserve or are not qualified for. It only will help you get a job you deserve. This by itself is a tall order, which is why I, as a recruiter, never present an unqualified candidate to a hiring manager. Unfortunately, too many candidates who are perfectly qualified have fallen far short of the presentation skills necessary to land the opportunity presented to them. This book is specifically written to them, to all of the hiring managers who will be hiring them, and to all of the recruiters who will help them make the right career choice. •	You can’t use a talent surplus approach for hiring top people in a talent scarcity situation. When the demand for talent is greater than the supply you must consider the hiring process from the perspective of a top person who has multiple opportunities. The big point: offer careers, not just another job. Too many companies default to the surplus model for hiring, offering lateral transfers and weeding out the weak. In the process, the best never apply. •	While much has changed over the years, much hasn’t. Top people are still very discriminating when it comes to changing jobs. Top people still don’t look for work the way average people look for work. And top people are still not willing to apply for a position before they learn about the potential upside first. However, how you find these people and reach them has changed profoundly. Merging the new with the old is how you not only find them, but hire them, too. •	A large majority of HR and recruiting leaders believe that their hiring problems will be solved by some magical new sourcing tool or the latest social media approach. They’ll be disappointed. Their quest for the next sourcing silver bullet will be as disappointing as the last one. Hiring top talent needs to be a comprehensive business system integrating all facets of the process from finding and sourcing candidates, including screening and selection, and recruiting and closing. Performance-based Hiring is a process that addresses all of these needs. •	Walk the talk. There’s more to hiring top talent and raising a company’s talent bar than a mission statement and a competency model. Executives need to rethink their company’s hiring programs and processes from top to bottom, inside-out, and backwards. Part of this is metrics, part of it is management, but the most important part is converting talk into action. •	Hiring managers need to take the responsibility for hiring outstanding people. This should be a core component of their performance review. While some hiring managers will do this on their own because they know hiring the best is not just idle talk, many won’t, and many aren’t capable of hiring people stronger than they are. On top of this, short-term pressures to deliver often outweigh the need to upgrade the talent level. External measurement systems need to be established to ensure a company’s talent acquisition strategy is implemented and executed properly. •	If you’re a candidate, recognize that most companies don’t do it right. So if you don’t get the job you deserve or the chance to get interviewed, it’s because you expected the process to work properly. It doesn’t, so play the hiring game to win. This starts by knowing how the game is played and knowing all of the rules, both written and unwritten, and then breaking them. Keep reading The Essential Guide for Hiring & Getting Hired and get the full book for Kindle and Kindle apps on all devices.